The album title befits the man. Joe Stump can shred and shred some more. 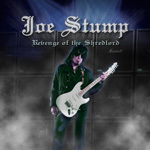 Revenge of the Shredlord is Joe Stump's ninth solo album. The Berklee College of Music Associate Professor lets it rip in the neo-classical heavy metal style. 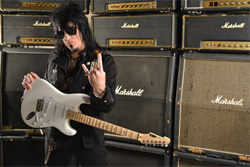 Joe Stump: a guitar and a stack of Marshall, what else could a man ask for? Essentially, except for a short reprieve in Master's Prelude, Stump bursts from the gates and never looks back. He rattles your ears with his electrifying speed and dexterity. While some past material showed extensive diversification of guitar styles, there's no question that his is a heavy metal shred album. The tone may also feel a little more dark and foreboding. At the very least the song titles reflect it: Enter the Coven, Evil Beasts Below, or The Black Knight's Castle. If any song summarizes this album it's White Knuckle Mayhem; it could be the fastest piece here. Try not to get run over. I wonder if Revenge of the Shredlord will be required listening for his students in the Fall semester. Recommended for guitar superfreaks everywhere. Joe Stump's Revenge of the Shredlord: just try and keep up with this veteran guitarist's flying fingers of shred mayhem.